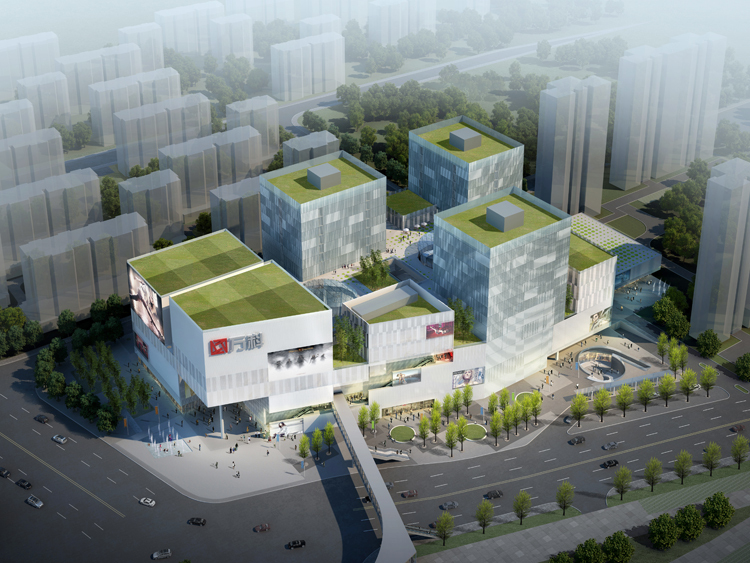 SPARK Architects have shared with us their award-winning design for a new mixed-use development in Beijing. Designed for Vanke in the city’s growing southern suburbs, the project is a mix of retail, leisure, entertainment and office programs. Currently under construction, Vanke Jiugong is a continuation of SPARK’s investigations into the breaking up of the architectural mass of the shopping mall, and the forging of connections between ‘interiorized’ space and the city. 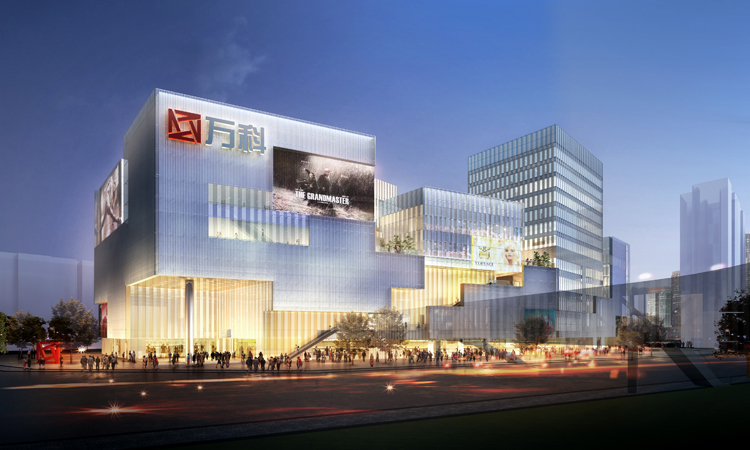 The 127,000 sqm development will incorporate a mall, a cinema, three live-work towers, and a separate retail pavilion, with a pedestrian bridge connection to an adjacent train station. The scheme proposes a perforated and penetrable building mass of interlocking components of various scales. A base retail block (with traditional curvilinear ‘race-track’ circulation) is prised open with glazing and voids at its periphery and pierced internally by two large conical voids, which draw daylight downward into the center of the building mass and forge visual connections between levels. A sleek white palette contributes to a seamless and flowing retail environment. On levels four and five, these volumes terminate with a second ‘ground plane’ – a village of restaurants in an orthogonally planned zone expressed with an alternate material treatment of timber and traditional terazzo tiles. Above is a third ‘ground plane’ – an environment akin to a miniaturized business park, where small office pavilions and larger live-work towers rise from a roof garden. “Level six will be a bit like a hutong in the sky,” says Clostermann, with the fragmented open areas of the garden taking a character similar to courtyards and available for the enjoyment of office users and the wider public. 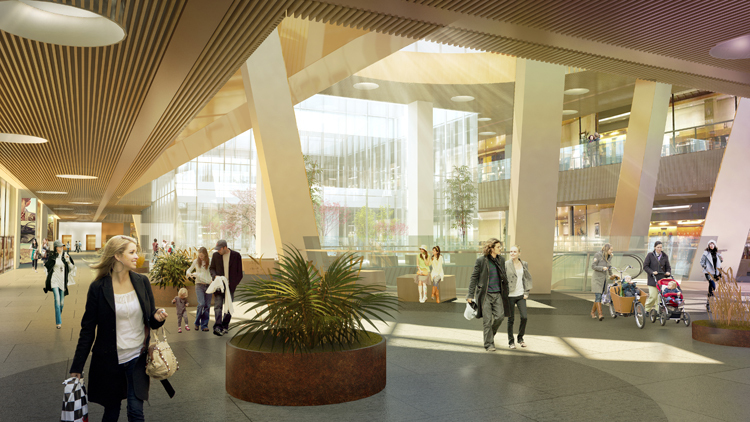 The cinema, positioned at one end of level six, will be connected to an external 24-hour circulation route that traverses the façade to allow direct access to and from the entertainment zone after shopping hours. While preventing the disconcerting experience of circulating through a ‘dead’ mall after hours, the external circulatory route will also enliven the exterior of the building, bringing vitality to its principal street façade.